There are reckoned to be just three overland routes in and out of Lebanon - and you are advised not to take any of them unless you have a very good reason to. All three pass through the Syrian border, which surrounds this small rectangle of land to the north and east. The Mediterranean is to the west, and to the south is Israel which is currently bombarding Lebanon following the capture of two soldiers by Hezbollah militants in the border zone on 12 July. Today, we took the most direct route from Syria's capital Damascus to the border at Anjar, crossing the Bekaa valley and climbing over the Lebanon mountain range into mainly-Christian East Beirut. The alternatives mean going much further, via Tripoli in the north of Lebanon, or going through the high mountain passes at Faraya. The normal staging post for our journey is Chtoura - all roadside restaurants and ice-cream parlours - but Israeli jets bombed the highway through the Bekaa, so all traffic must turn north and head for Zahle. Israel's rationale for this appears to be to disrupt traffic - though not cut it off completely, as there is a perfectly good side road to Zahle, no more than 100 metres from where the Israeli bombs landed. Approaching Zahle, we could see a thick black cloud emanating from the hillside behind - the first sign something was seriously wrong with the route our convoy had chosen. Our convoy stops to see what's going on up ahead. Zahle, a Christian stronghold dominated by a giant statue of the Virgin Mary, is famous for being a centre of hedonistic, epicurean Lebanon. Built into a deep ravine carved by the cooling River Berdouni, it boasts some of the country's best restaurants for mezze and arak, which at this time of year should be crowded with customers. Now local people have strong words about how Hezbollah has picked a fight with Israel at a time when Zahle should be minting it with summer holiday-makers. "The 'resistance' say they are defending Lebanon's sovereignty, but they are destroying its sovereignty," says a taxi office manager, referring to Hezbollah's armed wing. "They are destroying our town," he adds, before looking up at the giant statue on the hillside. "Only the Virgin holds Zahle in her protecting hands." People tell us that the Israelis have bombed a lorry heading up the mountain, said to be suspected of carrying missiles which Hezbollah guerrillas are regularly firing at cities deep inside Israel. The lorry was in fact carrying civilian goods - so perhaps it's Israel's way of keeping all westbound freight off these roads. Radio news reports say the driver was killed but his passenger managed to jump free from the vehicle. 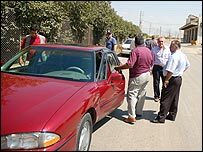 A quick change of cars - one of our Syrian drivers wanted to go back to Damascus rather than risk going deeper into Lebanon - and we were off again. 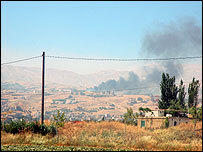 There was also news that Israeli jets were now bombing the eastern Bekaa, which cemented our group's decision to press on, although we could see no sign of smoke behind us. The new Zahle driver knew a way to circumvent the bombed truck, so we headed off up through the steep, picturesque backstreets of the town. Worryingly, we seemed to be heading straight towards the column of smoke - but just at the last minute we jinked to the right and rejoined the main Zahle-Bikfaya highway just above the bombed lorry. A civil defence fire truck was spraying water onto the wreck as its load still burned fiercely. A tense few minutes followed, squinting at the skies as our vehicles sped past other lorries grinding up the mountainside. Fortunately, the lorries were very few and far between. The contrast between the western Bekaa and towns on the other side of the Lebanon range was, frankly, startling. Here was another Christian area, but unlike the Bekaa, without a large Shia Muslim population, the sect from which Hezbollah draws most of its support. That meant something would have to go seriously wrong if these well-heeled towns overlooking East Beirut were to be bombed by the Israelis. 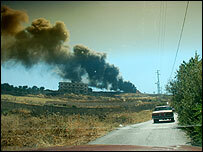 Therefore, down in the Bekaa, cars were driving flat-out and very few people were venturing out of their homes. But here, shops were open; scantily-clad Maronite Christians were strolling about, eating ice-cream; and in the open-air restaurants the first barbecues were being lit for the evening clientele. That is not to say that Bikfaya is not also suffering from the current round of fighting - normally this place would be heaving with Gulf Arabs on holiday, but they have already fled for their lives. For the rest of the descent into East Beirut, life seems similarly, eerily, almost normal - a world away from the Bekaa and the fierce, deadly Israeli bombing that has pummelled South Lebanon and the southern, Shia-dominated suburbs of the Lebanese capital. History lessons for US policy?